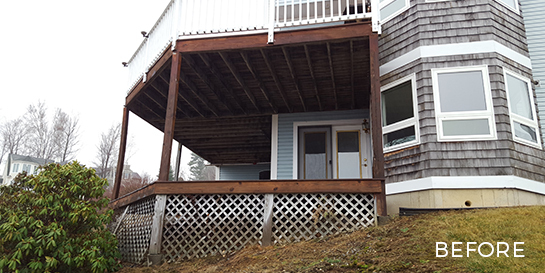 The existing deck was unsafe and not functional therefore we tore the deck down and rebuilt a new one in its place. The existing deck at this house was unsafe, worn and unusable. This project required substantial planning and creative thinking. Due to the property’s proximity to the lake, the project required a DES Shoreline permit. Once the permits were approved, the site work was able to begin. The site work was completed by Gilford Site Works. 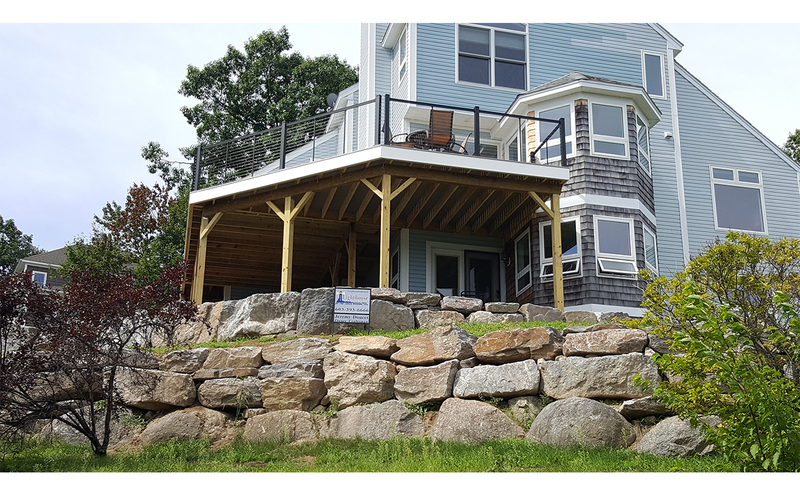 They were able to create retaining walls in order to tier and level the landscape around the deck area. 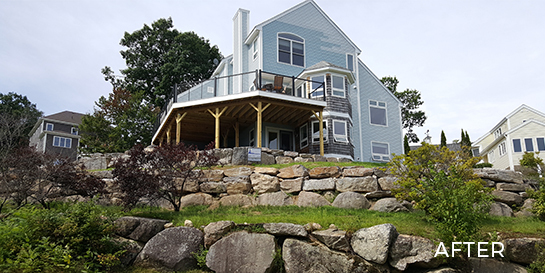 The ultimate goal for this project was to ensure the space under the deck could accommodate a patio and/or hot tub area as well as storage. 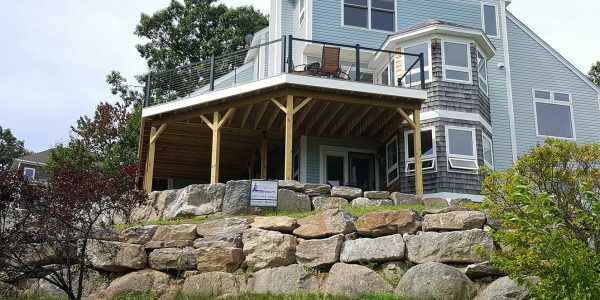 We were able to extend the deck out four feet laterally and include a new set of stairs by the garage in order to provide easier access for the customer to the deck from outside. In addition to those changes we also updated the existing exterior lighting and added additional lighting, including low voltage LED lighting on the railing posts and stair risers. Pressure treated engineered beams were used to support the structure. Often there are many inconsistencies in pressure treated lumber, therefore in order to ensure the best quality we ran every floor joist through a table saw in order to ensure each piece was identical. This provided a solid and level base so the deck floor was straight and flat. The materials used to complete the assembly of the deck were Azek PVC decking with Cortex hidden fasteners and Key Link cable railings. A custom cable gate was installed at the stairs to help contain the pets and secure the space.